A full range of robust cellular PVC cladding profiles, an ideal substitute for timber cladding. Will not discolour with time, retains its appearance, is virtually maintenance free and weather resistant and is an A+ wall system under the Code for Sustainable Homes. Shiplap cladding profile for horizontal installation. The visible bottom edges are square. The 300mm unit is a 2 x 150mm Twin Plank profile. Open V - Modern cladding, with a symmetrical V groove between profiles giving a sharper appearance to the joints. May be installed horizontally or vertically. Ideal for use as a soffit board. TeeGee - An almost flush finish, tongue and groove cladding profile forming a small V groove between profiles. May be installed horizontally or vertically. Ideal for use as a soffit board. 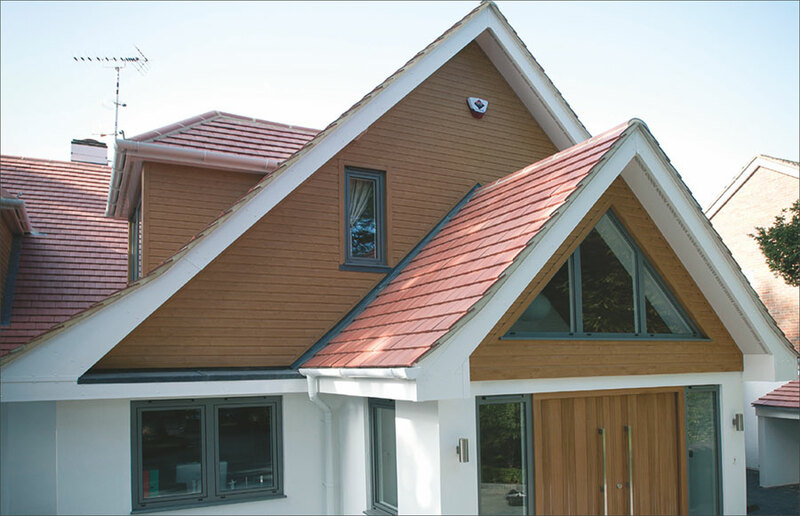 Feather Edge - Mimics the traditional, overlapping feather edge style of timber cladding, providing a rounded bottom edge. Intended for use in horizontal applications only. M-Boss - A Shiplap cladding profile for horizontal installation with a textured surface that simulates the patterns of a traditional timber board.